“Wait! Why are you off of the highway and on the back roads of a neighborhood?” Being on time is everything to me. Now I couldn’t always say that but when I received the revelation that what I sow is also what I will reap, I changed how I did things. We all want God and others to be on time for us but we don’t prioritize being on time for them. I want what I want when I want it so I do what it takes for me to get it and being on time is one of those things I want from others. Because I like being on time I treated this ride with the same respect to the principle of sowing and reaping. “I want to be on time please sir.”, I muttered peering out of the front window from my passenger/driver seat. I had to go and minister out of town so I positioned myself to circumvent any possible frustration, pressure or strain. I gave myself two hours for an hour and twenty minute drive. Okay so off to the plane we go for the thousandth time. Not with a new driver, mind you, but with one that has driven us several times. No need to give him directions because he knows exactly where we are headed. Well after riding for about an hour and ten minutes I looked out the window of a shaded sprinter only to see trees, parked cars, houses, and things that were totally unfamiliar with my usual route. I anxiously parted my lips and politely asked, “Where are we?” The answer I received was “Well, I was looking at my app and it says that traffic is the other way so I decided to take another route.” Huh!??!! My thoughts ran rapid, “Traffic is always inevitable on this route! We have been taking this drive for fifteen years now. The same way! You are not a new driver, and have driven this route several times before.” Whew! Stretch forth your hands to the screen, and say “Calm down DeeDee”. Lol! With restrained energy I gracefully asked “how long does your app say it will take for us to arrive at our destination?” The answer he gave me just drove me straight over the edge. I was so hott! I took pictures and videos to send my husband just to vent. Where is my regular driver and who sent this one? Lol! Smh! Finally we arrived at the airport super late and the door opened and my brother-in-law the driver, yes my brother-in-law, was standing there looking at me with this pitiful look on his face like he knew he had done something wrong. With disgust all over my face I’m sure, I asked him to never get off the highway again. The worst thing you can do is to listen to the wrong voice in the middle of the ride telling you to go in a different direction. Some of you are at a place in your life and it seems like if you get off of this road that you are currently on things will go so much faster and better for you but that is not always the case. The app the driver used didn’t document the traffic on the detour that it suggested. It’s just like Satan to give half truths tempting you to stray from your course. Think of all of the detours you have already taken in life and how it has set you back. You should be further along then you are right now. I would rather go at a slow pace and get to where I am going faster then at a fast pace and going a longer way and getting there much slower. The worst thing you can do is to listen to the wrong voice in the middle of the ride telling you to go in a different direction. I know you are in a lot of traffic right now. I know things are very busy and it seems to be taking a toll on you, but if you remain focused and keep going straight I promise you will see your way clear shortly. The road is about to open up!! 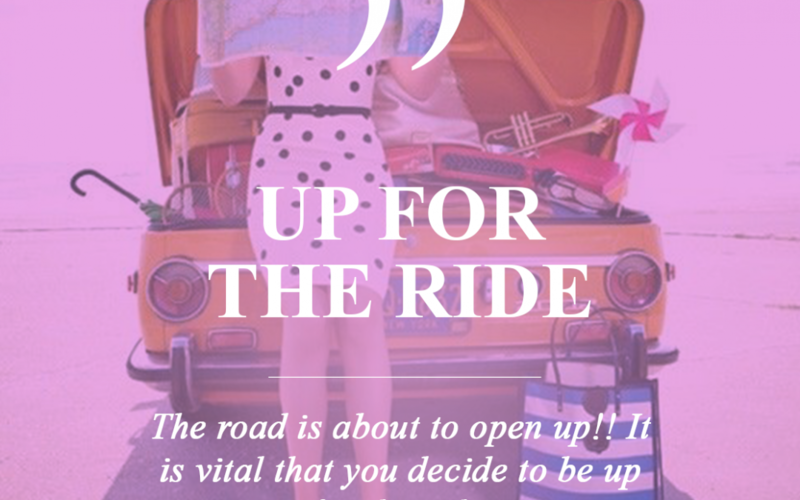 It is vital that you decide to be up for the ride. Pack your spirit with the Word and eliminate waste, that being anything and anybody that will hinder you from moving forward, and buckle up because you are about to take a ride into your destiny! Thank you for such an encouraging blog, when I read some your blogs it seems like you have written them just for me. Be blessed today and thank you. So timely in my life. I need to hear that!!!! Hello Kimber! Thank you for your response. It’s funny to me how God will show me or teach me a lesson in the middle of what I am doing. Blessings! Thank you for sharing your heart and the word of God with us. I am ready to take the ride into my destiny! Staying the course! I need to hear that!!!! Let me start by saying thank you for transparent, honest and sista girl ability to share.I get overly excited each time I see the title of each weeks blog and how they addressed to me “Destiny Awaits Genean C”, “Genean C We keep Our Word”, Genean C God is Such a Show Off” those small gesture mean a great deal! I know each week I can expect to laugh, a few Amen’s and some amazing words of wisdom and encouragement! This weeks post had all of those things and more, thank you Dr DeeDee for making me and thousands of women near and far feel like we are right there with you on this journey, added blessings! What a Mighty God we serve!!! I needed this blog this morning. Praise God!! Thank you Dee Dee and God Bless! Dr. DeeDee, I can not believe you (well I do believe you..lol)! You never cease to amaze me. I really needed you to personalize this one today. What a timely word and I receive. I pray that God will continue to give you creative ways to reach out to women across the world. I love you !! What a wonderful way to start the day – a reminder that Christ did it and so can I! Thanks for your transparency and encouragement. May God continue to richly bless you!! See you in Chicago in October for the Thrive! Conference. Thank you so much. This was confirmation for me that God is by my side. I took an alternate route to reach a higher grade level in my career quicker; however I’m stuck on a longer path to my dream position. But I’m buckling up because my destiny steps are coming! I thank you for allowing the Holy Spirit to use you, guide you and speak through you! This was an on time revelation for me and I am quite sure many others. Again thank-you and be Blessed! Thanks so much for this message. As an elder I can remember going off course many times and I lost not only time, but money as well. Over the years I finally learned to pray before listening to anyone or making major decisions in my life. This life lesson is good for all of us, not matter our station in life. Very encouraging word. I myself love being on time. That is my motto you reap what you sow. I loved your post. You keep it real and I really admire that about you and your husband.I like being on time too and I understand the importance of that now after having taught school for a number of years. Being late to church is like missing all of first period. Once recently I was late to church and the service was over. I rarely even get out now because I have bad side effects from meds. I have to move at a much slower pace since having a stroke, but I am able to watch other services online. My church only post a few minutes on Facebook. We, in the rural areas need to catch up in the area of technology. Pray for leaders to become innovative in reaching souls for Jesus and for ministering to their members. Thanks you Dr. Dee Dee for such an inspiring message reminded us all of te need to stay focused and to keep our eyes on the prize no matter what distractions and turns in life that come our way! May God continue to increase and bless you more and more! I MUST, I WILL, AND I CAN. STAYING FOCUS ON THE FOCUS. HIS NAME IS JESUS. That was good I like when you said what to pack and what to eliminate ! I myself always pack things that I shouldn’t ! This is so on time!! We don’t realize what we sacrifice in an effort to get there faster or by taking what we think are short cuts. I am blessed by this revelation. I have had to walk by faith as well as in silence lately.Focusing on the promise of his direction can be longer and lonely but it is for a much larger purpose. We sing where he leads me I will follow do we understand the cost? ?? Yes great blog and teaching lesson thanks for always giving insight. Thank you Dr. DeeDee for the right on time word. Such wisdom! Dr. DeeDee, this message today was definitely for me. 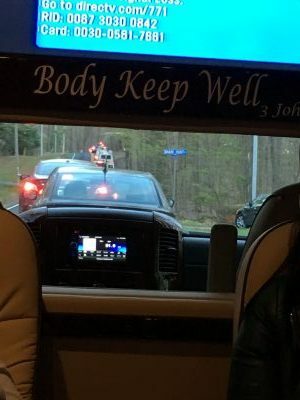 I honestly was on my way to the chiropractor two hours ago and on the way, I was literally thinking about how I could speed up a situation that appears to be taking longer than I would like. I heard the Spirit of The Lord speak and say to me to be still. Now your message today confirms some things. I look for to your blog on Mondays and Monday Motivation from my awesome Pastor, Dr. Wayne Frye. Thank you and many blessings to you! Right on time just what I need today. Glory to God! This word became alive in my spirit. Thanks for taking the time to minister to us each week. Love you Dr. Dee Dee! Very encouraging, I would always say the same thing, “I want what I want, When I want and How I want it” But, I don’t say it much anymore, after not getting what I want when I want and how I want it–Life. And, than I heard a minister on TV one time saying that we can’t always have what we want when we want and how we want it. Which just added to my thought, we’ll maybe not. Thanks for the renewal of thought. Also, I attend BSF, a bible study fellowship, we were studying the book of Matthew, in that study, I learned that obedience eliminates the detours. Thanks for the earthly example with a powerful heavenly/spiritual meaning. I’m encouraged. Amen and Amen. It’s not about the quickness, but its about the consistence. “Being confident of this very thing, that he who hath begun a good work in you will perform it until the day of Jesus Christ;” Philippians 1:6. Thank you so much for the encouraging word. So true! Veered off the path far too many times. I know where I am supposed to go, but finding it difficult to take the right path.Yet, I know that taking detours will hinder my progress. Pray that I will hear and obey his voice and block out the distracting voice of the enemy. Pray that God will bless me with true Godly friends. Great blog, needed this encouragement. Thank you this is so good!!! I was just thinking I’m starting to do my purity periscopes and I have to stay focused even my own personal life!! I can’t get off track in any way!! My message is for someone!! Thank you Dr. Dee Dee, my heart is touched each time I read your words of wisdom. I believe and receive in Jesus name Amen. THIS is why you’ve been “in my ear” since I was a toddler. Keep letting the Lord use you!!!!! I’m inspired to stay on the path!!! Thank you Dr. Dee Dee. I sure will! Thank you Dr.Deedee I really needed to hear that. So many times we get so frustrated along the way or with the process, But if we just focus on the the end and stay in the race we will to see the glory of God. Pastor Dee Dee this is such a right now work for the kingdom. Bless You! I recently prayed for an answer to a family matter and the answer God gave me was “Stay The Course”! When I read your blog it was just a reassurance that all I have to do is stay the course and God will fulfill the purpose he has for me!I trust Him to create my life story and give me all that I need to fully live out the path He has planned for me. Thank you for blessing our lives! Whew! All of that was Awesome! Thank you so much for the Nuggets! Thank you Dr. DeeDee for this encouraging blog. I so needed that message to stay on course. To not listen to distractions telling you to take another seemingly shorter or different path. I’m away from you all my church family in Grrmany on business and the challenges of staying on course have presented themselves. Staying armed with the word and remaining stayed on him has been my daily actions and desire . Your blog has given me new perspective and motivation. This is so on time for me! Holy Spirit has really been ministering to me about this! Thank you! This was a right on time word!!!! Wow…this use to be me Dr. Dee. But one day you gave an example of how you were in a grocery line and the shopper behind you didn’t wait and decided to go into another line; therefore missing out on the blessing that Holy Spirit had layed upon your heart for her. “I GET IT NOW! !” Quick and in a hurry is not always the best thing for us. Being sensitive to Holy Spirit is so vital in ALL that we do. Thanks for such an AMAZING word Dr Dee Dee! I’ve fallen behind in visiting your website due to busyness! lol..lol…I’m back NOW praise God for His intentional love and patience for and with us. I’m on course Now and will NOT listen to demonic directions to take me away from destiny! I’m writing my book that God says will be a Lifetime movie to help the saints. Please pray with me as I move to COMPLETION! I love you and your family! Thank you all for frontline service! Your blogs are always on time. I, admittedly haven’t read any of the one’s from last month; they have just been in my inbox. I decided to read them all today and they have truly blessed my life. I appreciate your delivery, so relatable. Thank you!